Three ingredients is all you need for a quick and healthy ice cream. 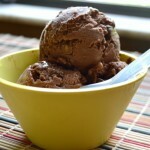 Vegan, gluten free and Paleo, this ice cream is for you! Using ripe bananas, cut them into chunks and place in the freezer for about 2 hours. Using a heavy duty food processor, blend the bananas until smooth. This will take a little time. If your food processor is having a hard time, add a bit of water, one teaspoon at a time. Once blended into into ice cream consistency, add the cocoa to the food processor and blend together. Finally, toss in the chocolate chips and pulse once or twice. Store in a sealed container in the freezer for the perfect hard-packed ice cream.